. : Lunar Palace v.5 - Japanese: Sailor Star Fighter :. Special Traits: Doesn't like loosing anything and hates giving up. Strong Points: Is faithful to their princess. 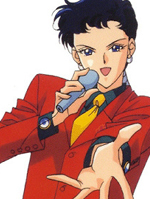 Seiya falls in love with Usagi, even though he knows that her boyfriend (Mamoru) is studding overseas in America, he figures that he still has a chance.